"It is true, isn't it? Your own Prime Minister Bibi Netenyahu cited talks between Hitler and the Grand Mufti." - Andrew Marr "Correct, 100% correct." - Israeli Ambassador Mark Regev The right wing of The Labour Party should watch this, and then pay Ken Livingstone the respect he deserves. The smears on Ken Livingstone have been an absolute disgrace - as has the treatment of Shami Chakrabarti and many others. "Has the ridiculously histrionic tone of politics become so unrepentently poisonous that instead of vindicating the former Mayor of London the Labour Party HQ are too embarrassed to admit that, post-Trump, the rise of the Alt Right and with them REAL antisemitism, this whole 'let's smear Red Ken' thing looks sickeningly & stupidly opportunistic?"" 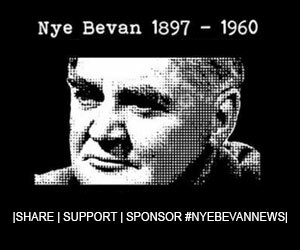 READ MORE HERE : https://nyebevannews.co.uk/israeli-pm-ambassador-back-red-ken/ #UniteAgainstTheRight #StillCorbyn #KeepCorbyn #NyeBevanNews #RedKenIsOurKen |Please Sponsor #NyeBevanNews|Contribute and help us grow paypal.me/NyeNews| We are 100% supported by the contributions of our page followers, we take no sponsorship or advertising revenue. Given that Ken Livingstone’s hearing for supposedly antisemitic remarks has been delayed until Tuesday, it would be salient for the right wing of The Labour Party to pay Ken Livingstone the respect he deserves. The smears on Ken Livingstone have been an absolute disgrace – as has the treatment of Shami Chakrabarti and many others. This whole narrative is based on the scribblings of the right wing blogger Guido Fawkes who David Baddiel caught out editing tweets to whip up an anti semitism smear, and to this day journalists and MPs are repeating it without checking. Just ask Dr Norman Finkelstein. This is the meme that caused ‘outrage’ for supposedly being ‘antisemitic’ when it was shared by The Labour Partys Naz Shah MP. However it has transpired that the meme was infact made by a Jewish American scholar named Dr Norman Finkelstein. Finkelstein is an American political scientist, activist, professor, and author. His primary fields of research are the Israeli–Palestinian conflict and thepolitics of the Holocaust, an interest motivated by the experiences of his parents who were Jewish Holocaust survivors. The likes of John Mann MP & Wes Streeting MP – neither of whom have any links to the Jewish community, save when they wish to manufacture a political crisis – and the others whipping up this faux outrage shall now have to explain how precisely Dr Finkelstein, a leading Jewish American scholar, is an antisemite. The right wing gossip blogger behind the antisemitism row, known as Guido Fawkes, was caught out by comedian David Baddiel editing the tweets that started this whole antisemitism meme. Fawkes edited a series of tweets to make his victim, Naz Shah MP, look antisemitic, when infact she was posting quotes from David Baddiels own comedy film, ‘The Infidel’. When he saw this, Baddiel, who’s own mother escaped Nazi Germany, called the blogger out for this gross misrepresentation. Regardless, Fawkes left the pictures up on his website with the #TheInfidel that provided the quotes with context photoshopped out. Despite the fact the claims could be disproved with an internet search, traditional newsplatforms and members of Parliament continue to reference Guido Fawkes’ intentionally falsified misrepresentation. The Daily Fail supported Hitler & the Blackshirts. Tom Watson received £200,000 to help cover his office costs from Max Mosely, the man who inherited the wealth of the Blackshirts. According to the traditional newsplatofrms, we aren’t allowed to call appointees and supporters of Blair, ‘Blairites’, and yet they are allowed to call Corbyn supporters ‘Nazis’. The Israeli Prime Minister made exactly the same comments as Ken Livingstone last year. Many followers of the Jewish faith are defending Ken Livingstone’s comments on the grounds that they are historically factually accurate – are they antisemitic? Or has the ridiculously histrionic tone of politics become so unrepentently poisonous that instead of vindicating the former Mayor of London the Labour Party HQ are too embarrassed to admit that, post-Trump, the rise of the Alt Right and with them REAL antisemitism, this whole ‘let’s smear Red Ken’ thing looks sickeningly, stupidly opportunistic? Let’s see what Parliament reveals on this topic. MPs are legally required to declare any conflicts of interest before a debate. At a debate on Israel’s illegal settlements in the West Bank, look how many Labour MPs ‘forgot’ to declare their connections to Israel – and only ‘remembered’ when the Deputy Speaker of the House of Commons stressed that they must declare. One of these talking heads is the Chair of the Labour Friends of Isreal. Her name is Joan Ryan and she was involved in a recent scandal involving a £1 million payment from an Israeli Diplomat to help “take down” a government minister. The Diplomat has since been expelled. Next articleWhy can’t the Conservatives Pass a Budget?